I got a list view for navigation drawer, how can I put list item like "Add Friends", "Settings" align at the bottom of the list view. I add a setting view to the footer view. The settings item appear at the last one in the list view successfully. But how can I make it to stick and align at the bottom? Thanks. You can put the ListView inside a RelativeLayout and assign android:layout_gravity="start" to the RelativeLayout. And set android:layout_alignParentBottom="true" property to the view you want to set to bottom of ListView. Jay Donga was really helpful, but I had to change two methods to insert a footer in my DrawerLayout. Not the answer you're looking for? 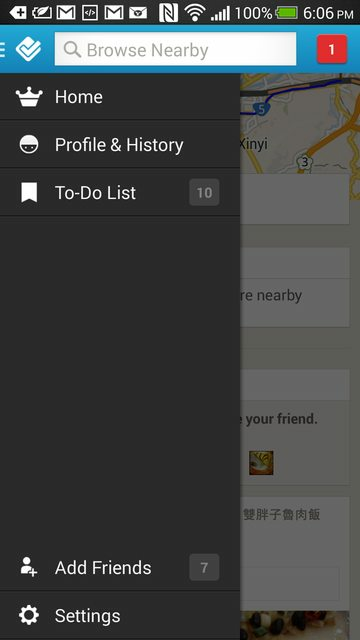 Browse other questions tagged android android-listview navigation-drawer or ask your own question. How to add footer to NavigationView - Android support design library? How to add some space under the last item in a Navigation Drawer?